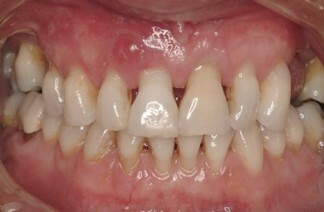 213 Treatment of acute periodontal infection – per appointment. This item may include establishing drainage and the removal of calculus from the affected tooth (teeth) or implant. This is an acute situation, which means the body isn’t coping with the problem at hand. This type of infection involves swelling, and even pus. Pus is that wonderful yellow liquid material. The material is essentially dead infected matter associated with an abscess. It also means the body is not coping well with the problem at hand. This problem originates in the area between the root and the bone called the periodontal ligament. When the calculus build up begins to travel down the root surface to below the bone, as discussed in “why we need a second visit for a clean“, the ligament that holds the tooth to the bone begins to be destroyed. The body is fighting hard against the bacterial content now in this area but it can’t remove the calculus itself. Eventually the products that the body uses to fight the infection start to destroy good tissue. This includes the bone and the ligament and the gums. 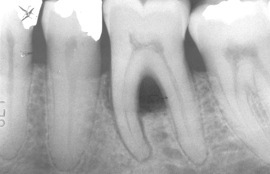 An abscess is a fluid filled space containing pus. Sometimes this can happen if some calculus breaks off and jams in the gum. A sudden impact of infective material can cause a rapid response by the body and an abscess may form. The pain from an abscess is increased greatly if the pus is trapped and the pressure builds up. 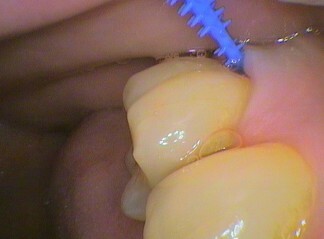 An abscess also accelerates the bone and periodontal ligament. It can be trapped under the gums, in the bone or even between the roots. Some medical conditions and general health can complicate the immune response of the body and this may mean further investigations. Treatment involves removal of the calculus and draining the abscess and thoroughly clearing the infected area. Medication may need to be applied in the gums. Antibiotics may be prescribed as well. Importantly after treatment maintenance and follow up treatment of the whole of the mouth is vital to successful long term outcomes. Prevention is always better than cure.